Pair Rockville KPS10 10″” 3-Way 1200 Watt Karaoke Speakers with Wall Brackets and MDF Enclosure. Peak Power: 2400 Watts Per Pair (1200 Watts Each). Program power: 1200 Watts Per Pair (600 Watts Each). RMS Power: 600 Watts Per Pair (300 Watts Each). 3-Way Speaker With Built-In 3-Way Crossover For Amazing Sound!. 10â Low Frequency Woofer With 1.37â, 100% Copper Voice Coil and 74 oz. Ferrite Magnet. 3.85â High Frequency Tweeter With 7 oz. RPA6000USB: Professional Mixing Power Amplifier with AM/FM Digital Tuner. 19″” rack mountable (removable rack brackets) digital hybrid amplifier/receiver. 4 Ohms: 125w x 2 RMS and 500w x 2 Peak. 8 Ohms: 100w x 2 RMS and 400w x 2 Peak. Built-in Preamplifier. Multicolor LED display. Digital Quartz Synthesized AM / FM tuner w/50 presets & auto scan. Preset EQ (rock, pop, classical, jazz). Remote control for quick access to all functions. Vacuum Fluorescent Digital output display meters. Pair of Rockville Tripod DJ PA Speaker Stands + Carrying Case Black RVSS2. Adjustable Height. Steel Construction. Black Color. Weight Capacity: 132 lbs. Adjustable Height Range: 47-79 inches. Base spread: 0-23 inches . Tube Diameter: 1.38 inches. Leg Diameter: 1.38 inches. Â Rockville RVSSA1 Universal 35mm Speaker Pole Adapter Bracket. Add a speaker stand mount to a PA Speaker. Mounting pole diameter: 35mm (1.375”). Length – 5.9″. Width – 4.7″. 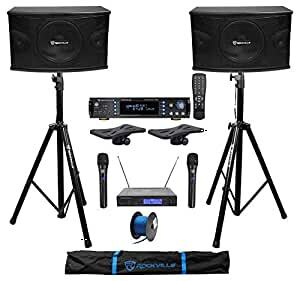 Rockville RWM1203VH VHF Dual Channel Handheld Wireless Microphone System. Large display on receiver + digital display on each mic. Each mic is large and solid with a nice weighted feel. Improved high performance wireless handheld microphone capsule. Rockville R14GBLU50 Blue 14 Gauge 50 Ft. Mini Spool Car Audio Speaker Wire. Gauge : 14 Gauge. Wire Length : 50 Foot Mini Spool. CUT FROM BULK 500′ ROLL. Color : Blue. Stranding : 72×0.15mm x 2C (72 Strands of 0.15mm Wire per Wire).